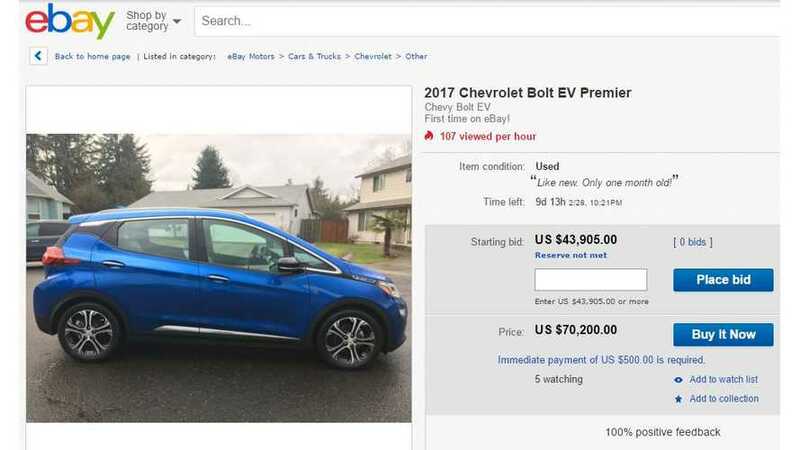 The first Chevrolet Bolt to find itself listed on eBay has a shockingly high buy-it-now price of $70,200, but the starting bid is lower. With a starting bid of $43,905 (exactly the same as the sticker price - see below), this Bolt is no steal. Even less so when you consider that it's already been registered, so the $7,500 federal tax credit is out the window. 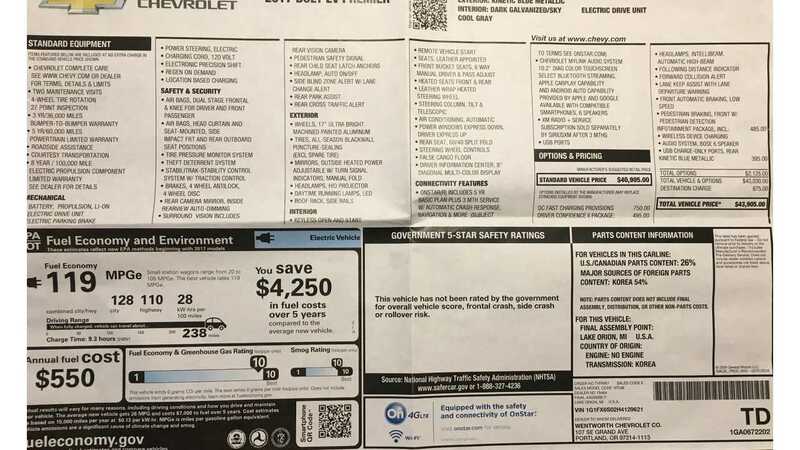 The seller does have a 100% rating, but nobody in their right mind would pay sticker price or more for a used, one-month old 2017 Chevy Bolt. At least we don't think they would. Here's a link to the listing if you'd like to check it out. Chevy Bolt EV. First time eBay Motors! Your are bidding on a 2017 Chevy Bolt EV Premier. This baby is fully loaded! Without a doubt this will be a Collectors car! This is the first run of a landmark, game-changing, automobile. I ordered this baby on 10/10/2016 from local Portland, Oregon dealership because I knew it was going to be a once-in-a-generation car. I’m making it available to you, on a national basis, because I know many of you want this car, but current distribution is still limited. Note: Price does not included any shipping. Price is delivered as picked up from my home in Portland, Oregon. If you want it shipped you must make arrangements. Because this has been registered you will not be eligible for the $7,500 tax credit. This unit is fully loaded! Every factory bell and whistle imaginable. Includes all LT Features: 17" Painted Aluminum Wheels, HID Headlamps, Signature LED Daytime Running Lamps, Electronic Precision Shift, Regen on Demand Steering Wheel Paddle, Rear Vision Camera, Keyless Open and Start, Single-Zone Automatic Climate Control, 8" Diagonal Reconfigurable Driver Information Center, 10.2" Diagonal Color Touch-Screen, Two Front USB Ports, 60/40 Split-Folding Rear Seats, MICHELIN® Self-Sealing Tires, Driver Confidence I, includes: Side blind zone alert, lane change alert, rear cross-traffic alert, and rear park assist. Includes all Premier Features: 17" Ultra Bright Machined, Painted Aluminum Wheels, Outside Rearview Mirrors with Turn Signal Indicators, Roof Rails, Leather-Appointed Seats, Front and Rear Heated Seats, Leather-Wrapped Heated Steering Wheel, Surround Vision Rear Camera Mirror, Light-Sensitive Inside Rearview Mirror, Ambient Lighting Piping on Instrument Panel, Lane Change Alert with Side Blind Zone Alert, Rear Cross Traffic Alert & Rear Parking Assist, False Cargo Floor, DC Fast Charging Equipped, Infotainment Package Includes: Premium audio, wireless device charging, rear dual USB ports Driver Confidence II Package Includes: Forward collision alert, low-speed front automatic braking, lane keep assist with lane departure warning, front pedestrian braking, and IntelliBeam headlamps. The driving dynamics of the Bolt EV are amazing. Has an amazing ability to be a real ‘road warrior’ because of the get-up-and-go across a large range of speeds. The visibility inside is remarkable. You sit high like a SUV and the large expanse of window glass allows for a great command of the road. While this is a 'C' class vehicle it feels like a 'B' class. This is because of the flat floors and cavernous forward cabin. Come and get this Kinetic Blue Metallic fully load Bolt EV. A truly fantastic car. Remember: Price does not include shipping. Price is delivered as picked up from my home in Portland, Oregon. If you want it shipped you must make arrangements. Because this has been registered you will not be eligible for the $7,500 tax credit.